Posted by Elana Anderson in Customer Analytics, Customer Experience, Database Marketing, Integrated Marketing, Marketing, Marketing Measurement, Marketing Technology, Online Marketing, Web Analytics. One of the bits of original thinking that I contributed to the discussion was a framework that breaks down five stages of Web Analytics maturity. Don’t pay attention to the stages for the moment… This is not a new picture (I pulled the base graphic from a from a client deck I presented in 1998). And, few would disagree. If a marketer is not leveraging any data to drive marketing communications, just adding a little bit of filtering or segmentation will have a tremendous positive impact on results. But, at some point, our ability to continuously improve results through segmentation levels off. At that point, the way to get the next hockey stick impact on results is to use individual customer data. Definitely not new thinking, but I think it helps level set us that is what “1:1” or “customer-centric” (you pick the cliché) marketing is all about – using knowledge about the individual customer to drive interactions that, at the end of the day, benefit both parties. Stage 1 – Site analysis: When we get started, we’re really just trying to get our arms around the data and the traffic on our site. The focus is to understand how visitors are getting to the site and what they’re doing there. But you also need understand why they’re there and whether they were able to accomplish what they set out to do. How do you do that? Avinash suggests that’s quite simple, ask. Stage 2 – Site optimization: The goal, of course, is to avoid analysis paralysis and look for ways to leverage the insight we are gaining about how visitors access and use the site to drive more visitors to the site, to optimize the experience of visitors once they are on the site, and to help more visitors accomplish what they were trying to do. Stage 3 – Segment targeting: As we continue to focus on improving customer experience, we inevitably start to look for ways to segment visitors into different groups either through data explicitly provided by the visitor or through insight inferred from the session and prior interaction data. We then apply the segmentation to customize visit experiences and target content. Stage 4 – Individual customization: At some point, our ability to continually apply finer segmentation and impact results levels off. That’s when we start to apply individual-level web interaction data to customize online interactions. Stage 5 – Integrated marketing: Of course, the holy grail of all of this is fully integrated and customer-centric marketing in which we seek to integrate insight from online behavior with what we know of an individual across other channels. And, we do this in order to inform and optimize all interactions – regardless of channel – with the individual. 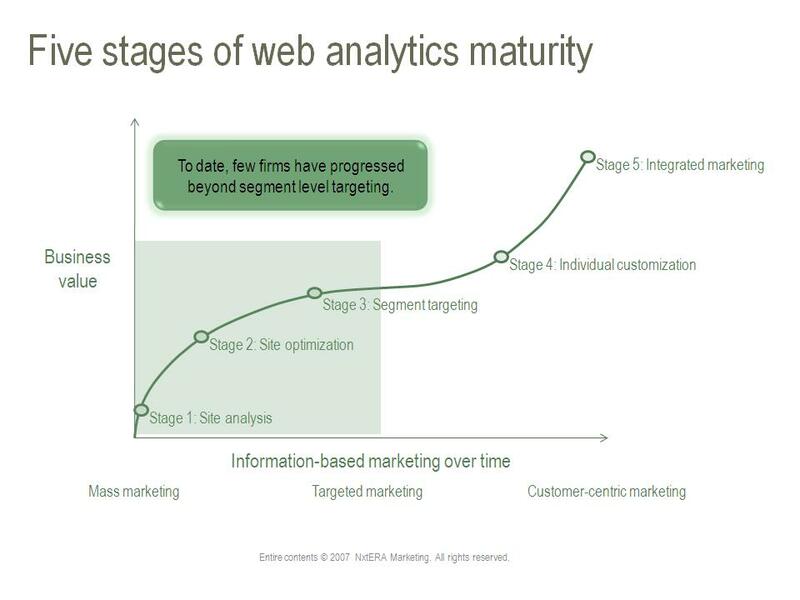 The sad part of all of this is that few companies have matured their Web analytics capabilities beyond Stage 3. In fact, I’d estimate that 80% (not based on a quantitative study!) of firms are at Stage 1 or 2. Why? Well, it’s darn hard! There’s tons of data to wade through, the industry is learning as it goes, and the technologies that help marketers move up the curve are still pretty immature and poorly integrated. So, how will this framework help? Use the framework to understand where you are today and what you want to work towards and over what time frame. Each stage of maturity focuses on unique business objectives, requires a different level of analytical savvy, and demands different functional capabilities from your supporting marketing technology. Over the next several weeks, I will continue to drill down on this topic with additional posts. Please add to the discussion by commenting and providing feedback on the blog or feel free to contact me directly. That’s a genuinely iprmseisve answer. Truly….such a useful web page.